Trust the rich, decadent Milanese to have to go one better than anyone else. At least that is how many people in the south of Italy would view the addition of saffron, or zafferano, to one of the staples of the nation's kitchen, risotto. Saffron has always been the most lucrative of spices, changing hands for high prices between merchants down the ages, not least because of the amount of manual labour involved in collecting it - on average it takes 150 flowers to produce a single gram. Those golden strands that you find in little boxes and glass jars are the stigmas, or stamens, of the saffron crocus, a native of Asia that made its way into regions such as Tuscany and the Abruzzo via religious and commercial travellers. It is also available in powdered form but nothing infuses a dish quite likely just one or two whole strands. But it is not only the flavour and aroma of the saffron that makes risotto Milanese a cut above the rest, it is the golden colour that it brings to the finished dish. To produce generous portions for six people, you will need around 450 grams of a superfino short-grain such as arborio or carnaroli, 50 grams of unsalted butter,1.5 litres of fresh beef stock (alternatively, use a good powdered stock such as bouillon), 100 grams of beef marrow sourced from the local butcher, half a medium size onion, three strands of saffron dissolved in a little warm water, 50 grams of parmigiano reggiano and some flat-leaf parsley. Take a good-size sauté pan or skillet and melt the butter on a low heat until it is nutty brown in colour. Add the onion, finely chopped to the pan and sauté until translucent (do not allow the onion to burn as this will affect the final flavour of the rice). Add the marrow, finely chopped to the pan, cook for a further two to three minutes, then pour the rice into the pan, stirring to coat the grains in the fat. Add one or two ladles of stock to the rice, ensure the heat is as low as possible, and allow to simmer slowly, resisting the attention to stir as this will only damage the grains of rice, thereby releasing too much starch and making it stodgy. When the rice has absorbed the liquid, repeat the ladelling process, adding the saffron and the water it infused in. The whole process of absorption/ladelling should take between 15 and 20 minutes. Test the rice - if it still retains a slight bite, then it is ready. Working quickly, add the parmigiano, adjust for seasoning, then stir in the chopped parsley. Transfer the rice to bowls and serve immediately. For an extra touch of northern Italian decadence, the risotto could be garnished with a couple of shavings of parmigiano and a drizzle of extra-virgin olive oil. 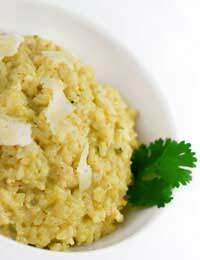 Risotto Milanese is traditionally served with veal shank, or osso bucco, but it will work equally well with some stuffed chicken breast or a pork escalope.